There have been two major rescues this week. The first was a call on my day off, to a deer running around a garden off The Glade in Uckfield. As we entered the garden the deer managed to jump over a fence into neighbouring garden. Whilst we were trying to assess the location and possible escape routes and how to catch the deer, it returned into the garden off The Glade, but was soon back out again into a garden off Grange Road. As we could no longer see the deer we drove round there in search of the deer. We pulled off the road to some garages and whilst we were looking around a Fire Engine with its blue lights on drove along the road. We couldn’t see the deer anywhere so decided to drive down into Olives Meadows where we were quickly flagged down by some people standing next to the Fire Engine. The deer we had been looking for had tried to get under a wooden fence and had become stuck. We quickly took control of the situation and let the Fire Officers return to their station. It was clear we didn’t have much time so gave emergency medication so lifted the deer onto a stretcher and rapidly got it into our ambulance. Rescuer Chris Riddington stayed in the back with the deer whilst we drove out of the estate round to Hempstead Lane where we unloaded the deer and got her released. She needed some encouragement to stand up but was quickly wandering across the field. She was clearly very stressed but her injuries were very minor. With every step she took you could see an improvement and once at the far side of the field she managed to negotiate a fence and hid in a wooded area to recover safely. 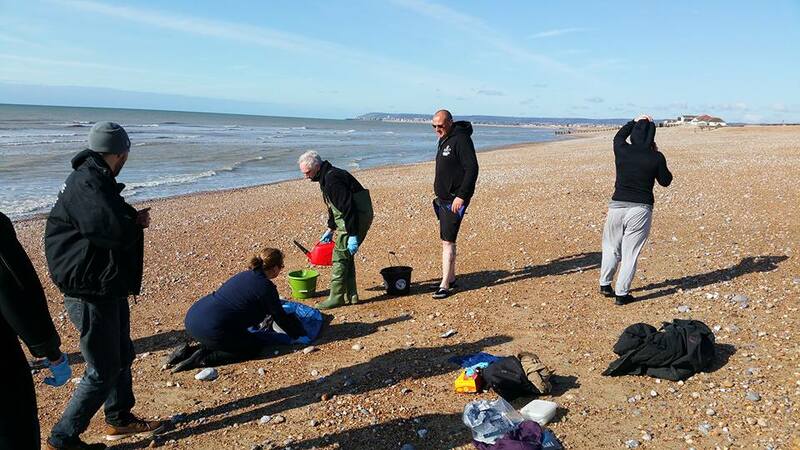 he second big rescue call was from British Divers Marine Life Rescue (BDMLR) – again on my day off – who asked for our help with a stranded porpoise on the beach at Norman’s Bay. Kathy Martyn and I drove down to the Casualty Centre and loaded up the rescue equipment, whilst Rescue Manager Chris Riddington drove to the scene in advance. 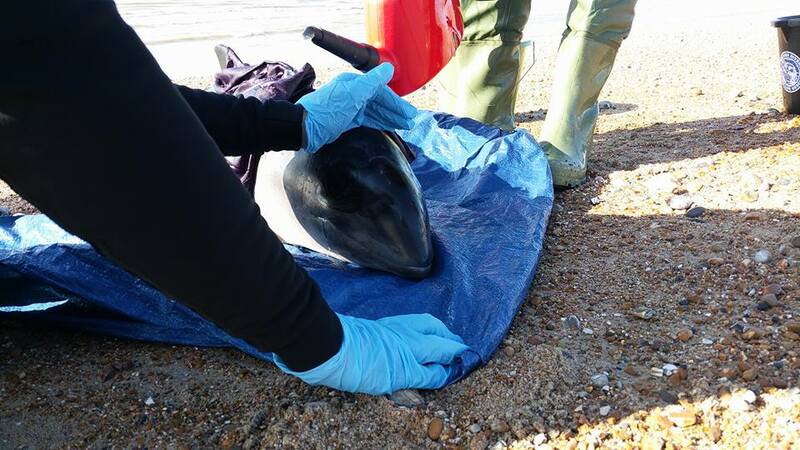 Stephen Marsh Operation Manager from BDMLR arrived on site and working with several other medics moved the porpoise into the water and held in securely without allowing it to go under the water too much. Although they look like fish they are cetaceans which are mammals so need to breathe air. It is important that such animals are not held under the water or they can drown. I arrived on site as they were bringing the porpoise out of the water. The creature’s lumber muscle was quite concave which indicates the porpoise had lost body condition over time and hadn’t been eating. She wasn’t very big either, just over a metre in length. They can grow up to 2 metres. On the tongue you could see the remains of Lingual Papillae which are used to help suckle from their mums. Although not a baby, this was a young porpoise but not dependent on its mum still. It is going to be very difficult to know why she was so weak and stranded. Because of how weak, underweight and lethargic the porpoise was, everyone was in agreement that the porpoise should be put to sleep. Sadly there are no facilities in the UK for rehabilitation of cetaceans, primarily because of how expensive they are to run, costing millions of pounds to run, and the infrequency of strandings would make it very difficult to locate such a facility where it would get used enough and have quick enough access to. We have had two more fox cubs come in, both poorly. 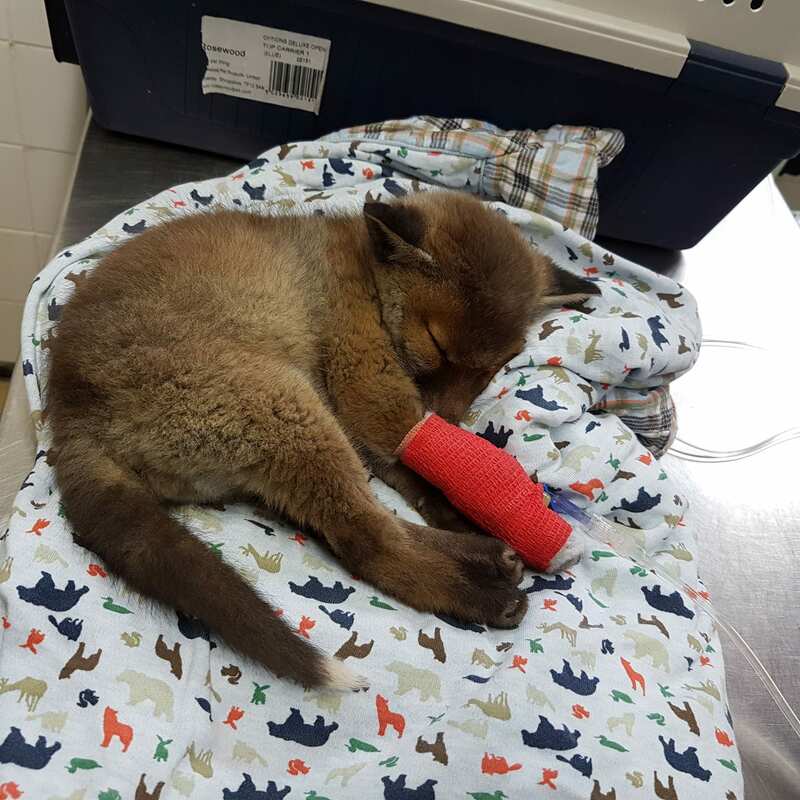 One little fox cub was rescued after being found wandering in Bexhill. 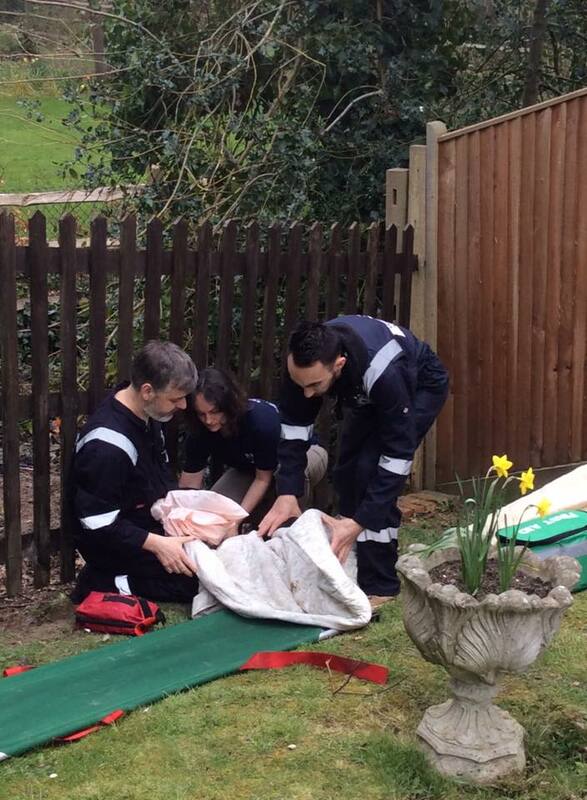 Another was from a vets in Bexhill after being hit by a car last. Our single duckling now has 3 new friends thank to Folly Wildlife Rescue. Rescuer Tony Neads collected his three new buddies and they are all happily in together and a lot happier as a result. We are getting a lot of calls from people asking us if we will remove nests of birds, dens of fox cubs and more, from callers gardens and houses. We are not a free pest control service. There are a number of extremely good Humane Fox Deterrent companies on the Internet who can advise or do on site consultations. As for birds they are protected whilst nesting so can’t be touched unless under licence. Taking advantage of the nice weather we have had we have managed to get a number of casualties back to the wild. Including two Jackdaws in Heathfield and Polegate, a couple of jackdaws from a wood burning stove just north of Brighton, a gull in Polegate and a wood pigeon from Uckfield who had been trapped in a chimney for a number of days to name a few. On the hedgehog front we have been a bit limited on the releases this week due to the colder night time temperatures. 16 were released including Daahl in Polegate, India at Ditchling, Bond in Uckfield, Noel at Sovereign Harbour, plus Goa released back in Hampden Park. Goa is the hedgehog who was found caught in a plastic beer can holder in the woods back in November last year who had to be overwintered. Other releases have taken place in Newhaven, Eastbourne, Seaford, Polegate, Piddinghoe and Hailsham. Out of the 96 we overwintered we have 35 left to go once it warms up.